Car window tinting is an excellent way to add value to your car and provides many benefits. UV Ray protection is a big positive for tinted car windows as its blocks harmful sunshine from people inside the car as well as the cars interiors that can keep them looking new. Along with blocking UV Rays, the temperature will also decrease by up to 65% depending on the tint film applied to your car. Privacy is the main reason car owners decide to tint their windows. If you must store valuables in your car, then tinted windows block the view from car criminals. From my experience, to get your car windows tinted by a professional may cost around 60 dollars per window but may even cost more than that. 2 How to Apply Window Tint Film? 3 Are Car Window Tints Illegal? 4 How to Remove Car Window Tint Film? There are several shade of tint to choose from as well as different colors. However the law around tinted windows may vary depending where you live. Therefore, check what tint shade is legal or take the risks associated with being caught. The percentages shown below are the amount of light allowed through the tint film. Unless you are aiming for a complete blacked out limo look and feel, 5% will not look good on the majority of cars. The tint shade of 20% is the perfect amount of darkness for the windows of most cars. The 20% shade is dark enough that you cannot see inside the car but you can see outlines are bulky objects such as a car seat and the driver. How to Apply Window Tint Film? An extremely important part of the process and if not completed properly will cause bubbles and lumps. This will mean redoing the whole process again. Use a strong glass cleaner, spraying plenty on the window to ensure good coverage. Use a chamois/clean cloth to dry the window then use a blade to remove any dirt on the window. Ensure that the window gasket rubber is clean, including inside the gap. Measurement and Tint Film Cutting. If you are using pre-cut window tint film, you can skip this step. A quick and easy way to do this is by rolling out the tint film against the outside of the window and unrolling the film side to side. Once the whole window is covered by the tint film, you can cut the film but ensure you leave a good inch leeway. Apply Wet Solution to Window. Place the tint film on the outside of the car window front facing. Next, remove the film backing and apply the soapy solution generously as you are peeling off the backing film. Apply Tint Film to Car Window. Ensure the window is wet and apply the adhesive side of the tint film to the wet window. One tip is to apply the tint film from the top first and work your way down but be sure not to crease the film as this will leave a permanent mark. Use a squeegee to press any wet residue and air bubbles from under the tint film (ensure the film is wet before doing this). Using the razor blade, remove the extra inch leeway. Start from the top and pull down the window slightly to get a better trim of the top. Once complete, roll the window back up and trim the bottom and side. Now finish off by pushing any water and air bubbles to the edge of the window. Once complete, its important not to use the windows for around three days and not to use any chemical solutions on the windows for over a week. View an informative window tinting video for further information of tinting car windows. Are Car Window Tints Illegal? A hot topic that must be understood before tinting your car windows. Almost every country worldwide allow the rear windows to have any shade (i.e. limo 5% shade) however the front of the car differs. In the UK, the law is quite simple that the front windscreen must allow at least 75% and front side windows 70% of light through. However, in the US the law varies state to state regarding front window tint, which makes the law very much a grey area. You can find the full details on regulations for car window tinting per state via Federal Motor Carrier Safety Administration. If you are worried and don’t want any fines or trouble, simply do not tint the front windows at all. From just tinting the rear of the car, you will still achieve the benefits and the cars looks will look better than no tint. How to Remove Car Window Tint Film? If the current window tints are scratch, bubbly or you simply don’t want to have them anymore, you have the task of removing them. To remove window tint film, you have the easy way, or the hard way. The hard way is by using an automotive heat gun, razor blade and your finger nails. The process of heating up the glass to the point the glue between the window and the tint film is warm enough to pick at. Then using your blade and finger nails, keep picking at it until its gone. The easy way with the help of GILA FR200 window tint removal spray. As used by professionals, the special formula breaks down the tint film glue that makes removing a lot easier. Simply spray, wait and then remove using the blade that comes with it. Read the instructions before use and of course, keep this product away from children. For those looking at taking their car to a stealth mode style, headlight and rear light tinting is a simple solution. 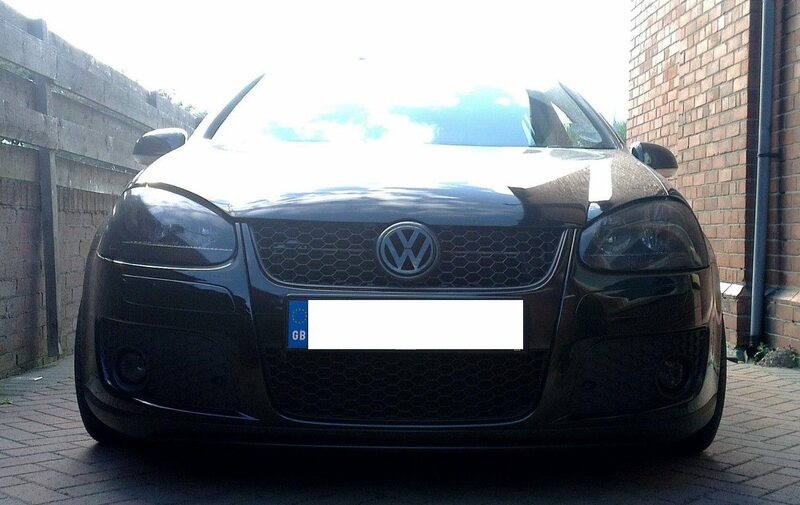 Whilst going for a stealth look on my MK5 Golf, I had the choice to either spray the headlight or apply tint film. Considering that I had paid a large amount for GTi headlights, I didn’t want to spray the headlights, therefore I used tint film. The headlight tint film follows the similar application to tint film but there is no need to worry about air bubbles with this product. It has tiny holes that allow light through and of course make it road legal. To apply, simply place the film over the top of the headlights and cut the necessary amount leaving an inch leeway. Using a hairdryer, simply heat up the film and push the inch leeway into the outside of the headlight. I have removed the tint film after a year and it is very simple to remove. Simply reheat the tint film and it can be pulled from the headlight. There may be some glue residue left over, however wash this off with soap and use a cutting compound to polish away the glue. There are many reasons to why you can’t tint your windows such as not owning the car or insurance reasons. The alternative to window tinting that we would recommend is the Shade Sox Window Shade that wraps around your car window. The Sun Shade is very easy to install as its very flexible and provides excellent UV Ray blocking to back seat passengers. Another benefit is that you can still roll down the window whilst having the Shade Sox on the window. We highly recommend this product for those that don’t wish to tint their windows.